We commonly say someone is “tongue-tied” when they are too shy to speak. Yet the term comes from a real medical condition. Without treatment, tongue tie or lip tie can cause serious problems with health and oral development, as well as causing embarrassment. Dr. Olivia Hart offers parents in the Richmond, VA area an advanced laser frenectomy procedure option. Frenum are folds of tissue that help to keep mobile organs in the body connected. One of these attachment bands, the lingual frenulum, moors the tongue to the floor of the mouth. There is another inside the upper lip; the labial frenulum. When a frenulum is too tight or anchored too low, it inhibits oral function. In infants, ankyloglossia (tongue tie) or lip tie can cause problems with breastfeeding, keeping the child from getting adequate nutrition. Over time, a tight frenulum may impact dental development, result in speech impediment, and cause difficulty eating certain foods. The condition is also linked to TMJ disorders and increased risk of tooth decay and gum disease. Frenectomy is a surgical procedure that releases this attachment, allowing the tongue or lip to move properly. 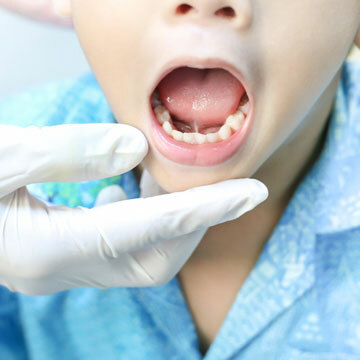 Historically, frenectomy was performed by snipping the fibrous band with surgical scissors or cutting it with a scalpel. Dr. Hart offers laser treatments for lip and tongue tie. Children benefit greatly from the procedure, and it is never too late to address the condition – adults can have laser frenectomy, too. Contact Dr. Olivia Hart of Richmond Family Dentistry to find out if an advanced laser frenectomy procedure could help your child. Click here to make an appointment now or call (804) 381-6238 to learn more.